Simple Things: Here it is - THE GIVEAWAY! It seems like most of my shopping dollars are spent online these days. I always shop first online – and only as a last resort will I venture out to the big retail stores, or, heaven forbid, the dreaded mall. I recently found a new favorite place to shop online, called CSN Stores – which is actually kind of like a virtual mega-mall – over 200 stores. Two things I like about these stores – first, most of the items I have looked at have free shipping. Now you all know I am a beancounter, and I know that there is really no such thing as “free shipping” – someone has to be paid to bring you what you order. What it really means is that shipping is already priced in – so there are no surprises when you go to check out. Secondly, they take PayPal, which is my preferred way to pay. My first purchase from a CSN store were shoes from Shoesgotsole.com – in my hard to find ski-length size. 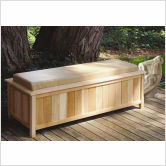 My last purchase was this cedar storage bench for my deck. One thing I love about it is the story behind the company that made it - Cedar Creek was developed to provide work and career opportunities for individuals with disabilities. 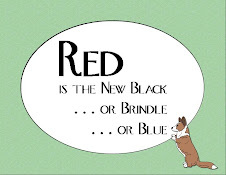 OK – enough about my shopping habits – you came here for the GIVEAWAY! The nice folks at CSN said that I can give away a $40 gift card, which can be used in any of their 200+stores! The contest is open to those in US and Canada. Many items have free shipping, but be aware that some items may have shipping charges or in the case of Canadian readers, international fees, for certain products. 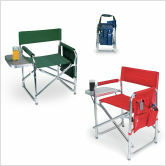 The $40 gift certificate would make a big dent on the purchase of the essential Picnic Time chair at tailgatepartyingsupply.com! 1. Just post a comment to this post with your email address (just so I can email you when you win - if you know I have your addy, you don't have to post it) saying that you would like to win. 2. Check out a sleeper sofa and post a comment letting me know which one you like best. 3. Blog a link to this post on your own blog, and leave me a comment here that you did that. 5. Facebook a link to this post (and leave a comment here saying that you did it). Please friend me if we have not friended already! Entries close at midnight EDT on Memorial Day, May 31, and I will post the winner ASAP. Good luck!! What a great idea~ I,too, prefer to shop online- I hate dealing with the crowds! Unless, of course, they are at dog shows and are accompanied by beautiful dogs at the end of their leads!! Hmmm... now where did I leave my credit card??? I looked at the sofas, there are lots of great choices. Hmmm, I like the LaCrosse in the brown leather. Me again- back from looking at the sleeper sofa's! I have to tell you, Janet, that since I have not seen your guest room, that was a tough assignment. So- I just picked out the one that I liked best- which is also one that would be perfect for my den, by the way. It's a nice- love seat size sofa bed- if you are like me, most of my guests are dog people, usually not a couple, so I don't really need a full size or queen size sofa bed. The Wildon Home San Clemente Convertible Sofa Bed in Beige looks good. What a neat idea! Thanks Janet! Of course I would love a gift certificate. :-) And I like the cedar bench too. I like the Wildon Home San Diego Convertible Sofa in Brown. Oh, I am dying for a picnic time chair. My favorite sofa is the Broyhill Laramie Queen Sleeper Sofa in Brown. online shopping rules, thanks for the intro to the new site. I'd love a GC for $40. Thanks for sharing. Jinnie @solsticecwc@gmail.com. PS how is Scout feeling? We would love to win. I love CSN Stores! They have lots of baby things I'd like to get for my son! Ohhhh pick me, pick me!!!! You know where to find me! Just visited the sleeper sofas and my favorite is the Handy Living Covell Convert-A-Couch Full Sleeper Sofa. Looks really comfortable and a steal at the $599sale price. I'm back again - I just linked your post on facebook. And Now it's posted on my blog. I don't twitter (yet) so that's the end for me - hope I win!!! Ooh, ooh, pick me!!! And just for FYI, the cute white puppy pen xpens I used for my puppies came from CSN, via Walmart.com. I know many people asked me where I found those white pens. "You and You" still feel badly that you slept on the sofa! Just put you on my blog. This is fun! Thanks for accepting me as a facebook friend! I'd also love to win!!! Here's the link to my blog. Okay, I posted it on my facebook. I don't twitter, so I get four chances. That's still a lot. WooHoo!!! oh gosh I almost missed it! pick me pick me!! Count me in! Glad I made it home in time to enter! I'm also posting the link on FB, even though there's only a few more mins to enter!